This is my first time using water decals. I always preferred nail stickers. I came across this set online and I couldn't resist the rose pattern. Priced at 150 INR these are definitely worth buying. Apply base coat and base colour to your nails. I've used white nail paint. Let the paint dry completely. Remove the protective sheet from the decal set and then cut out the decals as per your size and requirement. Using tweezers dip a piece in a small bowl of water for around 10-15 seconds. Don't dip it for too long though or else the entire design will slide off and will be difficult to place it on the nail. 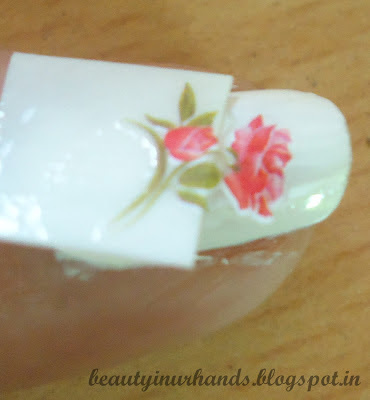 Just slide a small bit of the design from the backing paper and place that part on your nail. Slowly slide the backing paper off and the design will stay on your nail. You can use an orange stick to position the design on your nail. Using a tissue paper just blot off the excess water. Repeat the same procedure for the rest of your nails. Lastly, apply a layer of top coat to seal the design. The nail decals which I've used are very thin. You won't feel them on your nails. These lasted for more than two weeks. Impressed!! I will definitely try out the other designs too from Snapdeal. Water decals are better than nail stickers as they last long and also nail stickers are more obvious whereas you can't feel the water decals on your nails.